According to a recent study, electronic cigarette use (vaping) is associated with wheezing in adults. The study was published in the journal ‘Tobacco Control’. The study found that people who vaped were nearly twice as likely to experience wheezing compared to people who didn't regularly use tobacco products. Wheezing, which is caused by narrowed or abnormal airways, is often a precursor to other serious health conditions such as emphysema, gastro-esophageal reflux disease, heart failure, lung cancer and sleep apnea. Study author Deborah J. Ossip said that the findings are consistent with past research that shows emissions from electronic cigarette aerosols and flavourings damage lung cells by generating harmful free radicals and inflammation in lung tissue. "The take-home message is that electronic cigarettes are not safe when it comes to lung health," said Ossip, a tobacco research expert. 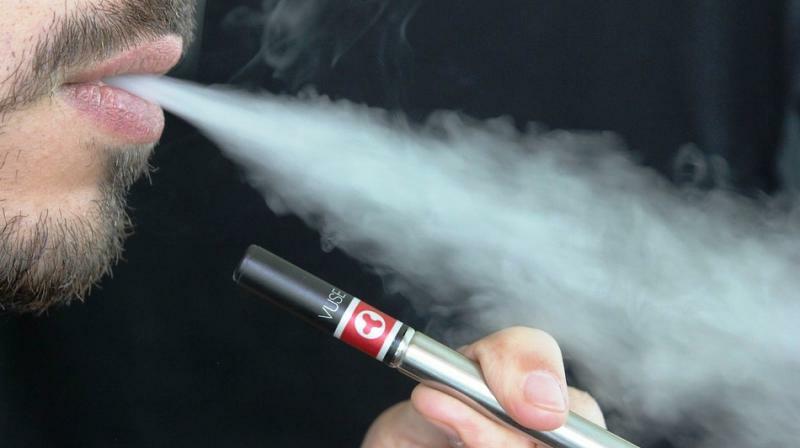 "The changes we're seeing with vaping, both in laboratory experiments and studies of people who vape, are consistent with early signs of lung damage, which is very worrisome,” added Ossip. Although electronic cigarettes are marketed as a less harmful alternative to cigarette smoking, many concerns remain related to the long-term health consequences of vaping. Researchers analysed data from more than 28,000 adults in the U.S. who took part in the Population Assessment of Tobacco and Health (PATH) study. After adjusting for age, gender, race/ethnicity, body mass index, second hand smoke exposure and other factors, adult vapers were 1.7 times more likely to experience wheezing and related respiratory symptoms (such as difficulty breathing) compared to non-users. Senior study author Irfan Rahman said that the research clearly identifies another health repercussion from vaping. This is particularly concerning given new data released from the Centre for Disease Control and Prevention that shows a dramatic uptick in youth vaping. According to the report, in 2018 vaping increased by 78 percent among ninth to 12th graders and 48 percent in sixth to eighth graders. With the emergence of small, sleek vaping devices that are used with nicotine pods in hundreds of different flavours (popular flavouring chemicals include fruit, candy and dessert), Rahman fears the number of young people who vape will continue to grow and that serious health consequences, including allergies, loss of immunity, and subsequent infections will follow. The study found that people who vaped were nearly twice as likely to experience wheezing compared to people who didn't regularly use tobacco products. Wheezing, which is caused by narrowed or abnormal airways, is often a precursor to other serious health conditions such as emphysema, gastro-esophageal reflux disease, heart failure, lung cancer and sleep apnea.